How long have you been in the PSO? I joined in 1996 and have been the leader of the group since 1997. How did you come to learn the violin? I went to a school which had everyone in grade 3 learn a string instrument. Everyone quit the next year except me. 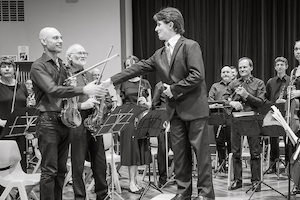 What was your favourite performance experience with the PSO? Definitely the 2004 performance of Carl Orff’s Carmina Burana. Orchestra and choir enjoyed themselves thoroughly and the audience were very appreciative. I work as a business analyst in a bank. I recently worked on a project to deliver mobile banking apps for iOS and Android. Which musical figures would you invite to your house for dinner? I would invite Bach, Mozart, Brahms, and Shostakovich. I would serve them Crust pizza.